The Peace Bridge Authority opened this new pre-inspection pad on the Fort Erie side as a pilot program to examine and speed commercial traffic through the Peace Bridge. The program, which will last six to 12 months, began Monday. A temporary measure aimed at reducing truck traffic congestion at the Peace Bridge began Monday after nearly 20 years of discussions between the U.S. and Canada. The pilot project that will allow U.S.-bound trucks to be pre-inspected at the more expansive plaza in Fort Erie, Ont., was celebrated by a group of high-level officials from the United States and Canada, who said they hoped the measure would become permanent. While both countries expect that the pre-inspection pilot program will reduce congestion and delays for U.S.-bound trucks, trucking companies are waiting to see how the test of the new inspections configuration plays out. But it creates a new rolling stop on the U.S. side for trucks that have been pre-inspected in Canada. The first pre-inspection pilot program, in Blaine, Wash., and Surrey, British Columbia, created some delays for trucks, though that program was testing the technology more than anything else, Bradley said. “The experience certainly for truckers raised an awareness with us; we have to make sure that we get it right,” he said. 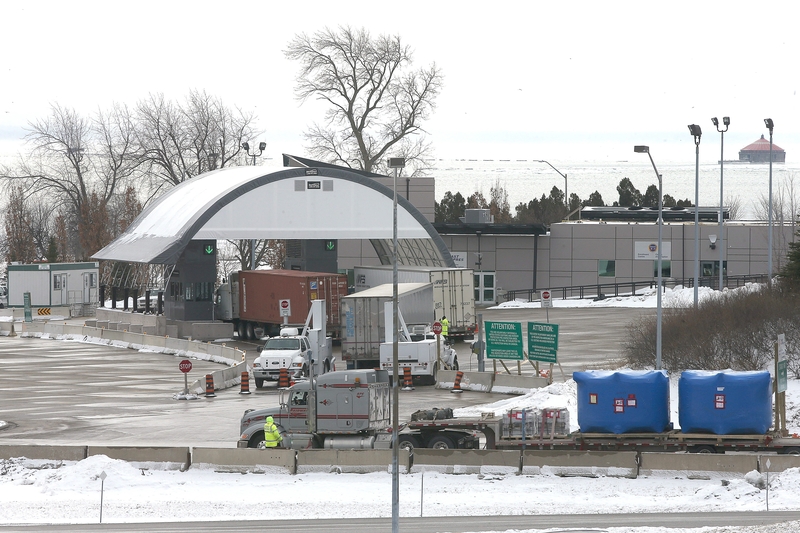 The Peace Bridge pilot allows two pre-inspection booths for U.S.-bound trucks on the Canadian side of the bridge, where radiation screening and basic primary processing will be performed. The U.S. inspections on the Canadian side will operate from 8 a.m. to 4 p.m. Monday through Thursday during the pilot, which will last from six to 12 months. • Trucks wanting to enter the U.S. via the Peace Bridge will be pre-inspected at Fort Erie. About 10 percent of trucks end up requiring secondary inspection, and those must stop on the U.S. side of the bridge. Drivers won’t know if they are good to go or if they need a secondary inspection until they reach the U.S. side. A U.S. Customs official in Fort Erie will alert a U.S. Customs official in Buffalo to let them know if the truck should get a red or green light. The speed of that alert is what concerns Bradley. Already the bridge authority has found that the 10 percent of trucks that pay a U.S. Customs fee with cash or credit card – not through a prepaid device on their truck – will go straight to the U.S. side to pay, and go through pre-inspection there as well, said Ron Rienas, bridge authority general manager. The payment adds 45 seconds to the process; Customs booths on the Canadian side aren’t set up to accept payment, Rienas said. The project requires more Customs and Border Protection employees and supervisors because they will have to be on both sides of the border. Sen. Charles E. Schumer, D-N.Y., said he made a deal with the Department of Homeland Security that he would secure funding for 2,000 more Customs agents if some were assigned to bridges in Erie and Niagara counties. High-level U.S. and Canadian officials – including Alejandro Mayorkas, U.S. deputy secretary of homeland security, and Steven Blaney, Canada’s minister of public safety and emergency preparedness – hailed the pilot, which could be duplicated at other crossings if it is successful. It is part of both countries’ “Beyond the Border Action Plan,” released in December 2011. “When fully implemented beyond the pilot phase – which we hope to be the positive conclusion of this testing effort – the concept will provide real, immediate and much-needed congestion relief at the Peace Bridge corridor,” said Anthony Annunziata, authority chairman. The project was first talked about in 1995 but has been delayed because of changes in both national governments, and also because of the United States’ practice of arming its Customs agents, which was not the case in Canada. Canadian Customs agents are now armed.